The best price for 50 mil automotive butyl and foil sound deadening! You are not just buying an excellent quality sound deadener but also saving more than 20% comparing to Gtmat, Boom Mat, Dynamat Extreme, Hushmat and Stinger RoadKill! Now everyone can easily eliminate the annoying road noise in the vehicle. We've designed the product that pretty efficiently handles the rattle and reduces noise while being affordable to almost everyone. Kilmat would deaden the entire car for the same money that would be enough to only insulate the doors using the expensive brands material. Automotive self-adhesive insulation consists of butyl. KILMAT sound deadening has a total weight of 0.35 lbs/1sqft. This weight ensures optimum efficiency and sound insulation that could be possibly gained from 50 mil thickness material. KILMAT 50 mil is light weighted sound deadening material! Car insulation KILMAT has a special indicator as to if it is installed correctly. The special embossing on the foil must be rolled out with a roller till it is plain smooth, then you'll be 100% sure that the soundproofing is set correctly and professionally! The sound dampening material comes in handy size sheets which make it easier in terms of cutting and installation process! Sound deadening material specifications: Nominal thickness 50 mil; Total coverage area of 50 sq.feet; Number of sheets in the stack 47; Nominal sheet Size 9.8x15.7 inch. Roller is not included. 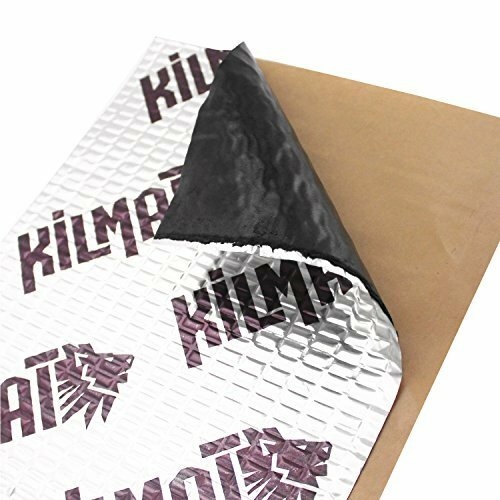 Kilmat 50 mil as a whole is a high quality sound deadening insulation. We offer unrivaled quality sound deadening material for the best price on a market. It turns out to be more cost-effective solution than such brands as Dynamat eXtreme, Fatmat, Gtmat, Boom mat, Hushmat, Second skin and Stinger RoadKill! Kilmat 50 mil is light weighted automotive sound deadener! Vibro-dampening layer is a composition of butyl and different improvers. These compounds have to be used in correct proportions so the maximum soundproofing efficiency is achieved. Kilmat 50 mil sound deadening mat features high level of adhesion! Kilmat is easy to cut, install and it is overall a very user-friendly soundproofing material. Kilmat does really work! This insulation pads eliminate vibrations, reduce overall noise and rattle level of your auto thus allowing for higher comfort. Kilmat 50 mil does also improve a quality of your car stereo system. However, using Kilmat 50 mil as standalone will not be 100% solution to sound proof your vehicle while still making a sensible difference. We recommend using Kilmat 50 mil in combination with a layer of closed cell foam, which is a special heat and cool insulation material and additional noise barrier. PLEASE NOTE! Correct installation of material is 50 % of success in the process of car soundproofing. Carefully roll down material to the degreased surface with the roller. Special embossing on the foil is made for convenience of installation so you can see the areas that are properly rolled down and those one needing more pressure.